A quick edit today--when I checked my comments this morning I discovered a nice lady named Maggie invited me over to her site for what she calls a linking party. Become a follower, link a project, make a comment, and link back to her in your post like I've done above, and Voila you get some new visitors to your blog. Thanks Maggie for inviting me. This is the closing post of the first day of July. Just mind boggling for me. This is my first time playing at City Crafter. I thought I had made notes on the sheet with the sketch, but I don't remember how I found them. It looks like it's going to be a fun place to play. I do love a good challenge. The sketch worked out perfect for the back drop of the Alcohol Ink Technique. After watching Mr. Holtz's video I broke out my alcohol inks that I have had for a couple of years. I never really did like the results that I came up with at first so they went on a back shelf. For some reason I like the results I got today better than any in the past. I think I might have used a lighter touch today when I was pouncing. 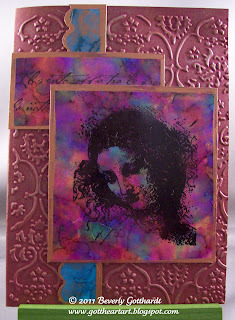 Burgandy card stock dry embossed and rubbed lightly with Copper Metallic Rub-On. The finished product kind of gave me a museum quality feel. Your card is fabulous! I love your choice of colors for the alcohol ink background. I like your card sketch, the stamp you used and the embossed secondary background.Good work! Beautiful use of alcohol inks! Love the design and colors! Great image! Wow! Beautiful work with those TH ink, I just love them, thanks for playing along with us at CCCB! GORGEOUS! Thanks for joining us at CCCB! WOW!! I just love this... Thanks so much for playing along with us at CCCB!